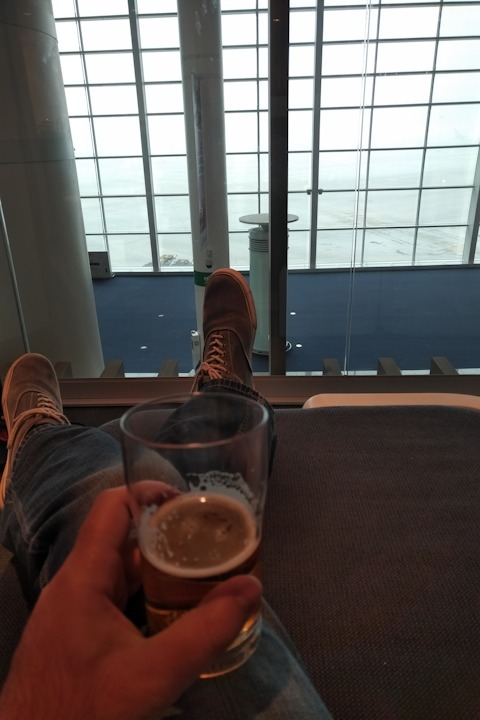 ​With most of my linkbuilding customers based all around the world, and many of them large accounts that require a hands on approach to account management, I've racked up a lot of business travel since starting my agency. 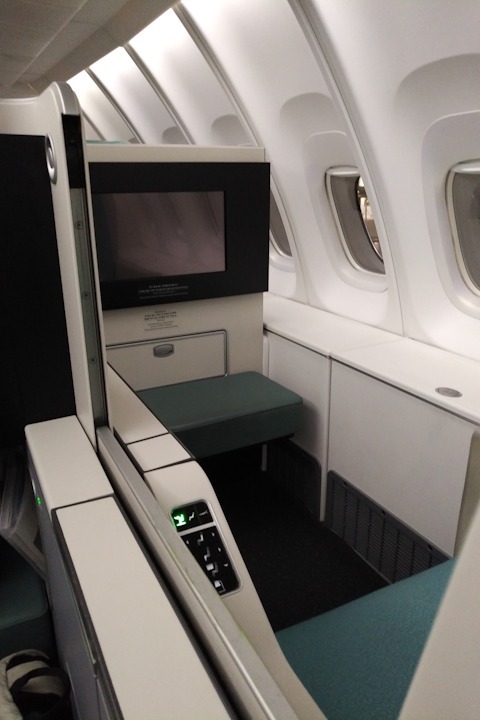 Along the way I've gone from being squashed in the middle seat at the back to flying up front in comfort, without expanding the budget anywhere near as much as I'd have thought was necessary when booking those early trips. What I've learnt has come mostly from thousands of searches on ITA Matrix and dozens of other travel aggregators and online travel agents, and also from reading dozens of travel blogs. It's disappointed me how many of them simply regurgitate news, the same obvious redemptions in First (flights to Japan... hotels in Hawaii), and push credit cards like the banking apocalypse is a mere day around the corner. The right cards are, of course, an essential part of any rewards plan but we won't be doing any affiliate nonsense here - if I mention a card it's because we've used/tested it and we won't be earning a penny from doing so. 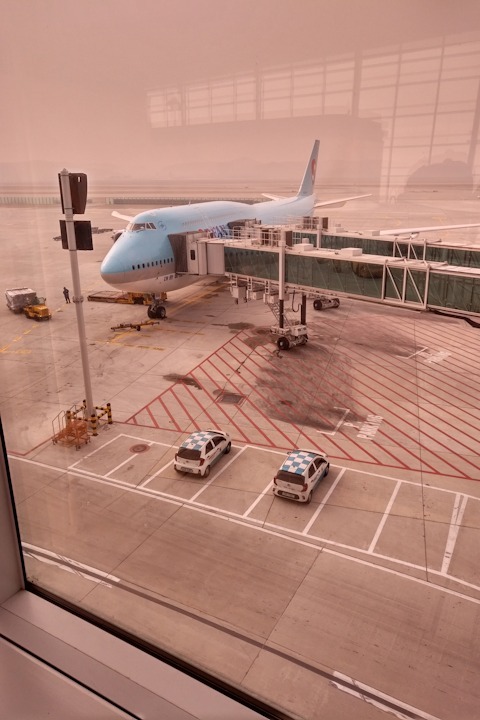 Those blogs are often not much use to the typical business traveler unless you're prepared to put in some serious time sifting through the guff for the real gems. Once you've done ​the work though, you'll be able to find some great deals and travel in a lot more comfort, all while earning rewards on your travel that pay for future free experiences. I'm hoping this blog will be a nice shortcut for many of you and get you where you need to go faster and in more comfort. So let's get into the story where we'll take Vin D'Eletto (owner of WordAgents) to Brighton SEO. You can use the tips here to travel to a conference in your industry, or just to learn more about miles, points and travel to anywhere (with your family) and optimising your business spend so that it actually rewards you (ie you get a lot more than some puny 0.5-1% cashback on a card and nothing else). However Brighton SEO was the inspiration for it all - it's one of the biggest SEO conferences in the world with thousands attending, yet many in the US believe it's too expensive to hit up European conferences. At the same time they had AMEX as one of their flagship sponsors last year and their slogan was something like "Don't Do Paid Media Without It" - something along those lines anyway. And the two together got me thinking that with the powerful rewards credit cards available in the US through many different providers and the spending patterns of most agencies - even small ones with just a few advertising placements a month or a few freelance writers to pay via PayPal etc - racking up travel rewards and beating this $1,281 total cost to be in Brighton should be trivially easy. Reach Creator will be doing a dinner at the September 2019 Brighton SEO event and anyone who follows along this blog or the parallel coverage on our youtube show SEO Unmasked and makes it out in September from the US (or further afield) will get a free invite to join us and our other guests - subject to availability we have run out of spaces before in Vegas. Given the reduced options for limos in Brighton vs Las Vegas though I'm not promising Garrett will sort you out a limo ride to the event like ​he does at PubCon! ​Over my many trips down to the conference, my favourite hotel to stay at is the Hilton. It's just one block across from the Brighton Centre (the home of Brighton SEO) on the seafront. Being part of a major chain it's easy to rack up points and redeem them for a cheap room here if you're travelling on a budget. Room service is 24 hours (important for when you get back from all the parties) and many attendees will also be staying leading to some great networking opportunities in the bar/restaurant before the main parties get started. ​So get registered over at Hilton Honors (visit the Hilton site and sign up) and do a reward search for yourself for the dates (hit 'use points' in the search options). You can definitely do this on less points - we're all arriving the day before the conference starts so we can have a relax in Brighton before the 12th. We won't be attending the training day but will be at the preparties (unofficial) and the official party on the 12th. And I assumed for most international travellers from the US, heading back on Saturday​ would make most sense as it's tough to fly back West 'overnight' and missing the after-party after coming so far would be foolishness! But for those of you looking to 'join in' from Europe - simply jumping on the 12th might work or 12th+13th if you can arrive fresh and fairly on time on a 6am flight from Europe, and depending if you want to stay the night for the party on the 13th. But for Vin's requirements here were two redemption options available. 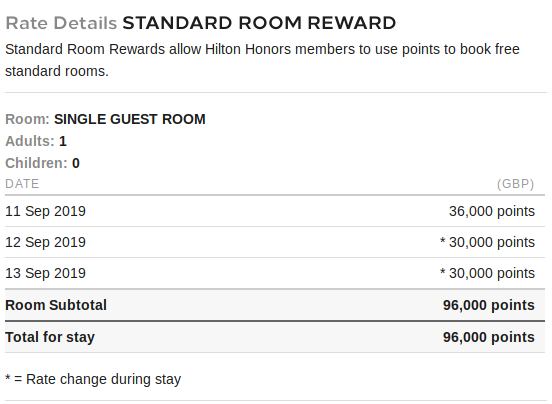 One would require simply clearing a standard bonus with a Hilton card, the other would require either a little spend or a top up with Hilton's current 100% buy points bonus for 20,000 points. So just 10,000 points would need to be purchased. The offer runs until about 26th Feb (they run promotions like this fairly often). Note that some people are only seeing an 80% offer so YMMV on the specifics but it still could work out worth it to get the nicer room. If I'd known I was going to write this post I would have taken some pictures as on previous stays have tried both these room types but in general terms I'd say if you can afford to top up the points it's worth the $100 to get the nicer room for 3 nights. You can see the buying points options by clicking 'points' when signed in then 'buy points' on the sidebar. 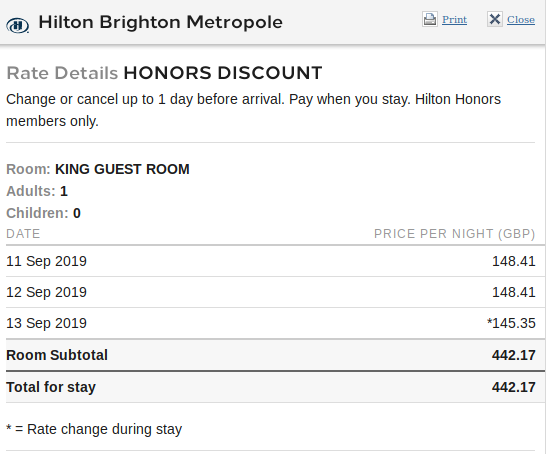 ​It's worth noting here that the rates quoted are variable - Hilton doesn't have a fixed award chart - and the single/cheap rooms sell out for cash very quickly due to the conference so it's possible only the higher priced/nicer rooms are available by the time you come to book. ​Compliance note: I'm not a credit broker, whether this card is suitable for you is totally your decision, I'm just showing how Vin is getting to Brighton SEO etc. I don't get paid for this! So wait... why am I not linking anywhere and where's the 100,000 points? ​Simply put AMEX makes public offers that are lower than the enhanced offers you can get if you are referred by a friend who has the card so if I link to the above offer you're missing out on 25,000 points. So grab a referral from a 'friend' online (or speak to Garrett, host of SEO Unmasked - @garrettpallado on Twitter - and he might have some codes left). The refer a friend bonus on the free card is 100,000 points and Vin grabbed that via Garrett (I can't refer as I'm UK-based and Vin is US-based - you need a cardholder in your country - in any case the Hilton card is not available in the UK currently). ​As you can see Vin has completed his $1k spend on the card and received his points ready for transfer. They usually go from AMEX to your partner on the statement date but YMMV - I'm in the UK with my cards and I understand the experience can be slower in the US sometimes. You'll also note that he has more than 100,000 points. That's because you earn 5x Hilton points per eligible $ spend on the card so he's picked up nearly 6,000 extra points already. The key here is to only ever spend what you'd have spent anyway. Vin had some personal expenses coming up so got the personal card, but with most of the cards I'll mention here, the US has a business version too so you could have cleared a bonus using a business HHonors AMEX too. If Vin puts his (say) $500/week​ general household expenses on the card for 6 weeks that would net him the remaining 15,000 points. ​So Vin's room (picking the nicer King) is £442.17 which translates to $574.60 for the three nights. If he achieves the 120,000 points through spend he'll have spent a total of $4,000 equating to 14.3% cashback on his usual household spend. And converted that into his free stay. If he achieves the 120,000 points through his bonus + buying 20,000 for $100 he's spent $1,000 to save $474.60 off the room rate (only paying $100 of the $574.60) equating to 47.46% cashback on his $1,000 spend. ​So hopefully this is starting to make sense now - by leveraging sign up bonuses and/or just regular spend on a highly rewarding card, we can stay in hotels for free. The Hilton in Brighton may not be the highest value redemption you can get with your points and for some of you just buying the room and saving points for sexier redemptions may make sense - however this story is all about Vin and his trip to Brighton so I'll leave going into more detail on any programmes we discuss for future posts. 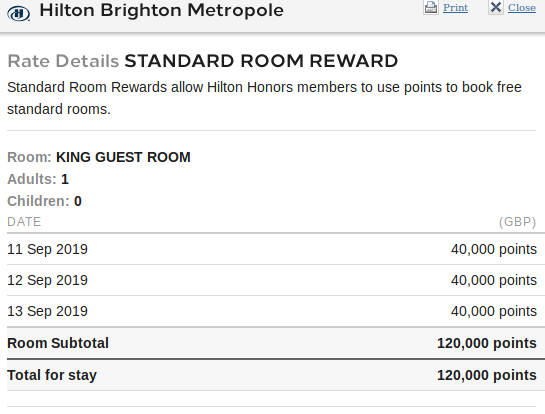 Buy 20,000 Hilton Points for $100 (before 26th Feb 2019 - see above you may get a slightly less optimal bonus than the 100% so may end up paying $120ish) or spend $3,000 more on the card. Book through your Hilton Honors account when the points clear using the 'pay with points' option when searching dates. The reason I'm recommending Vin just buys the spare points is he's likely to want to clear some more bonuses to get the free flights - in which case 'saving' the additional $3k spend may get him there sooner. If you're really trying to do this 'as close to free' as possible then you'll want to just run your regular household spend through the card until you have the 120,000 points and then book. But we're all about the speed for this case study so we're onto the airline cards now and will report back once Vin has booked his flights! This is the first time I frequented your website page and thus far? I amazed with the research you made to create this particular publish incredible. Excellent job! Thanks for the feedback – are you heading down to Brighton?